The OHMI (One Handed Musical Instrument) Trust Gala Concert will take place on Friday 7 September and will be hosted by comedian Al Murray. The Gala Concert will form part of the 2018 OHMI Conference and will feature performances by Felix Klieser and The Petry Sisters – who all play with their feet. 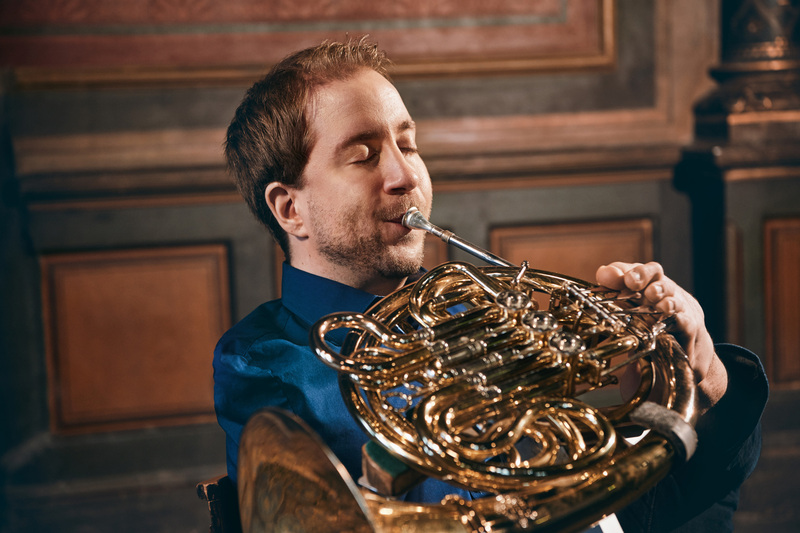 Virtuoso French horn player Felix Klieser will be making his UK debut at the Gala Concert which is taking place at the Royal Birmingham Conservatoire on Friday 7. Performing Mozart’s Horn Concerto No 4., Felix is an ambassador for the OHMI Trust, a UK-based charity which pioneers the development and adaptation of musical instruments for physically disabled people. Despite having been born with no arms, Felix took up the horn at the age of four in his native Germany. Now 27, he plays with the instrument fixed into a specially-designed stand and operates the valves with his left foot. With his right foot, Felix operates a rolling stand which enables him to change the sound of the horn with a mute. Felix has won the Leonard Bernstein Award, and performed as recitalist and soloist with ensembles as varied as the Berlin Philharmonic Orchestra and with singer-songwriter Sting on his world tour. The Birmingham concert, a celebration of virtuosity by disabled musicians will also include recitals by the first big band formed entirely of disabled musicians, Bader’s Big Band, and performers from the Royal Birmingham Conservatoire. Inga Petry and Elena Petry – known as The Petry Sisters – were born in Siberia and adopted by US music teacher Jennifer Petry, who also works as a director and consultant for music students with special needs. Although Inga did not have arms, she insisted that she get her chance to play, and began cello lessons on a viola placed at her feet before she turned three years old. Inga is now 18 years old, studies cello and has performed all over the US and across the UK. Elena Petry began cello lessons at the age of eight, also studying with her mother. She plays on a 7/8 cello granted to her by the PLAY Foundation, and uses an adaptive cello holder and bow holder made for her by May We Help, the volunteer, non-profit organisation in Cincinnati that has worked with both girls throughout their musical studies. The pair will play Vivaldi’s double cello concerto at the Royal Birmingham Conservatoire concert. Established in 1982 by the friends and family of RAF flying ace Sir Douglas Bader, The Douglas Bader Foundation advances and promotes the physical, mental and spiritual welfare of physically disabled people. The foundation’s musical arm, Bader’s Big Band, is the first ever big band to be formed entirely of disabled musicians and highlights the benefits that music can bring to those whose lives are affected by disability. Any deficiency or disability in one hand or arm makes traditional instruments unplayable to any reasonable standard. As a result, millions across the world are excluded from music-making for the lack of suitable instruments. This includes people with congenital disabilities such as cerebral palsy and hemiplegia, amputees, those who have suffered a stroke or developed arthritis. To overcome this, the OHMI Trust runs an annual competition to encourage inventors, designers and instrument makers to develop a musical instrument that can be played without the use of one hand and arm, and that has all the characteristics and facility of a traditional instrument.